Estonian Association of Architects presented their traditional honorary medals today. 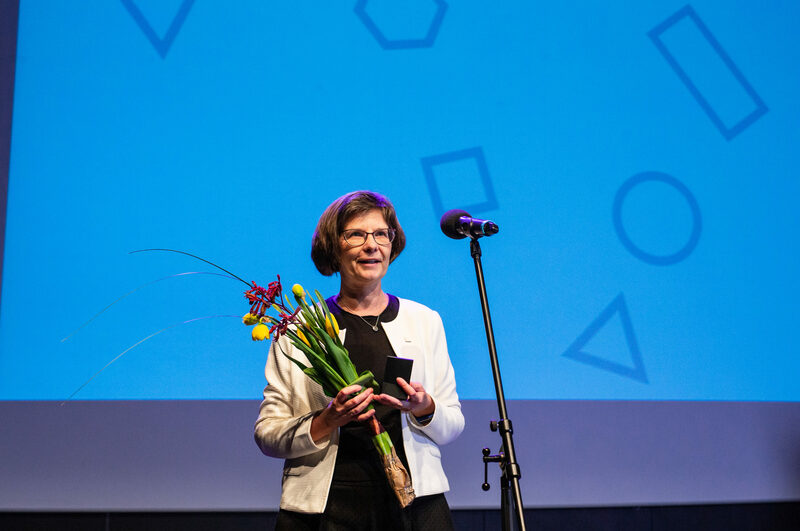 Anu Kivilo, CEO of the Arvo Pärt Centre, was awarded the honorary medal as the Best Commissioner of Architecture for the commission of the new building of the Arvo Pärt Centre. Jaano Tootsi from AS Ehitustrust, the manager of the construction project was awarded the honorary medal of Best Builder. Katrin Koov, President of the Estonian Association of Architects presented the medals designed by Rait Siska and Risto Tali at the festive ceremony at KUMU this evening. According to the explanation of the Estonian Association of Architects, “Anu Kivilo has fulfilled the task of commissioning a new building with dedication and commitment, trusting the architects and acting as a mediator between all parties. Although not active in the field of construction herself, she has carefully prepared and managed the whole process from organising the architectural competition with the Association of Architects to the completion of the building and keeping it in operation. As a commissioner of architecture, she highlighted the most important during design and construction and acted as a balancing force between the wishes of the architects and what was actually feasible”. Jaano Tootsi, manager of the construction project for the Arvo Pärt Centre, received recognition for promoting a high construction culture. Jaano Tootsi, manager of the construction project, as well as the entire team at Ehitustrust have proved that quality is a matter of honour for them – this is evident from every single detail in the building of the Arvo Pärt Centre. The builders took their work very seriously, worked with the architects’ ideas and helped them realise these ideas. Jaano Tootsi created an atmosphere of trust between the client, the building inspector, the architects, the team of designers and the builders, being able to find solutions that would satisfy all parties,” the Estonian Association of Architects noted. The Estonian Association of Architects has been awarding honorary medals since 2005. The traditional categories of Best Builder, Best Commissioner of Architecture and Best Publicist were complemented in 2014 with the honorary medal for the Best Colleague. Proposals can be made by all members of the association and the laureates are selected by the managing committee of the Association.